Baseball is three days away! Three days! Sure, we got two “regular-season games” with the A’s and Mariners that I sadly woke up to watch last week, but those didn’t feel like real games, and the A’s certainly did pitch like they were real games. Real baseball begins on Thursday when the entire league plays. With baseball back this week, it’s time for the 2019 over/under win total predictions. Five overs and five unders for the season. On paper, the Yankees are the best team in baseball. Unfortunately, “on paper” doesn’t win the World Series and starting the season with Luis Severino, CC Sabathia, Dellin Betances and Aaron Hicks all unavailable, and Didi Gregorius out until at least midseason isn’t exactly helpful to exceeding a win total of 96.5. Thankfully, the majority of Major League Baseball isn’t trying to win and getting back near 100 wins won’t be that hard. Outside of the Yankees, Red Sox, Indians, Astros and maybe two other American League teams, the AL is more top heavy in 2019 than it was in 2018 when six teams lost 89 games or more. You can pencil in the Yankees, Red Sox, Indians and Astros for the playoffs right now, and whichever team is “lucky” enough to clinch the second wild card will have to play at Yankee Stadium or Fenway Park for the one-game playoff. The AL has become predictable. Are the Yankees going to go on the kind of historical run they want on from the end of April until the end of the June? No. But I also don’t see them being a barely-above-.500 team from the end of June on the way they were last season. Thanks to their incredibly easy schedule to open the first three-plus weeks of the season, for once, the Yankees can get off to a good start and separate themselves from the .500 mark for good as early as the opening series. There is this idea the Cubs are trending in the wrong direction and won’t be good for some reason in 2019. Listen, I don’t like the Cubs and would like nothing more than for them to be a disaster this season, but it’s just not realistic. The Brewers will once again be right there contending for the NL Central and the Cardinals and Reds made vast improvements, but it’s still the Cubs’ division to lose, just like it was last year until … they lost it. The Cubs still have arguably the deepest lineup in the NL with three potential MVP-type candidates in it and when Jose Quintana is your No. 5 starter, you have more than enough starting pitching. The Cubs let the entire offseason pass them by without doing anything to enhance their team, but even so, it’s still a contending roster, and it’s not a seven-less-wins-than-last-season roster. Another AL power, another over. The Astros won 103 games last year and 101 games the year before. Despite Dallas Keuchel in his prime no longer being in their rotation (at least for now), I think the Astros might actually be better this season than they were the last two. They’re certainly not 6.5 wins worse. The Astros’ biggest problem (which clearly wasn’t much of a problem after winning the World Series in 2017 and reaching the ALCS in 2018) was that their lineup wasn’t long. The addition of Michael Brantley — a player I wanted the Yankees to sign instead of Brett Gardner — gives them that length as they can now stack George Springer, Jose Altuve, Alex Bregman, Carlos Correa and Brantley in some order one through five. That’s a very scary one through five. The rotation is weaker than season’s past with Keuchel and Charlie Morton essentially being replaced by Wade Miley, Brad Peacock and Colin McHugh, but that’s not a bad backend of the rotation, and the Astros have proven the last two years they aren’t scared to go out and add payroll or make a big move at the deadline. I would be shocked if the World Series was won by a team other than the Astros, Yankees or Red Sox. One of the three is getting there, it’s just a matter of not having a bad series against whatever mediocrity comes out of the National League. It’s hard to find overs to pick and believe in when nearly all of baseball seems to be trying not to win, or at least not investing in winning. The Angels are my pick for the second wild card and while I don’t trust them, I think they will be at least a .500 team in 2019. I could see them being a 90-win team this season, which is enough to eclipse their number. The Angels have a sneaky good lineup led by the $430 million man and then a rotation full of No. 3 and No. 4 starters (Tyler Skaggs, Andrew Heaney, Matt Harvey, Trevor Cahill) and a bullpen of inconsistent relievers. It’s not a championship-constructed roster, but it’s good enough to be two games over .500. I hate this pick, I really do. I don’t want the Phillies to do well, but unfortunately, one team in the NL East is going to win 90 games and I think the Phillies have the best chance to do it. My Phillies pick is more of a process of elimination pick. The Mets? I’m not about to ever back the Mets to meet or exceed expectations even if their number is four wins lower (85.5). The Nationals? They had trouble scoring runs and winning games with the face of their franchise. I’m not sure how an 82-win team gets an 88.5 number when their biggest addition was one-year-wonder Patrick Corbin. The Braves? They are the biggest threat to the Phillies in the division, especially since they won 90 games last season, but a lot has changed in the NL East since last season. The Orioles won 47 games last season. 47! And that was with a half season of Manny Machado playing at an MVP level. This season, they won’t have Machado at all and will have the worst roster top to bottom in the league, much worse than last season’s roster, which won 47 games. If this number were at least year’s 47 it would be too high. At 58.5 it’s outrageous. I would write more, but nothing more needs to be said about a team potentially set up to be the worst team in the history of Major League Baseball. That’s right. I’m putting the Red Sox here. The Red Sox aren’t winning 108 games again. That’s a guarantee. Or unless Chris Sale’s shoulder isn’t right or David Price reverts back to crappy David Price or Nathan Eovaldi turns into the Nathan Eovaldi Yankees fans know. Outside of a rotation that’s banking on Chris Sale’s shoulder to continue to hold up, David Price to avoid falling off again, Rick Porcello and Eduardo Rodriguez to be consistent and Nathan Eovaldi to not turn back into the Nathan Eovaldi that caused every team until the Red Sox to give up on him, the Red Sox’ biggest question is their bullpen. Their ownership basically said to the fan base “We won the World Series, we’re reeling in the spending” as they chose not to bring back Craig Kimbrel and are going with a bullpen so shaky that their starting pitching became their non-closing relief options in the playoffs. That can work over the course of a month in the postseason, however, it’s a recipe for disaster over the course of six months in the regular season. 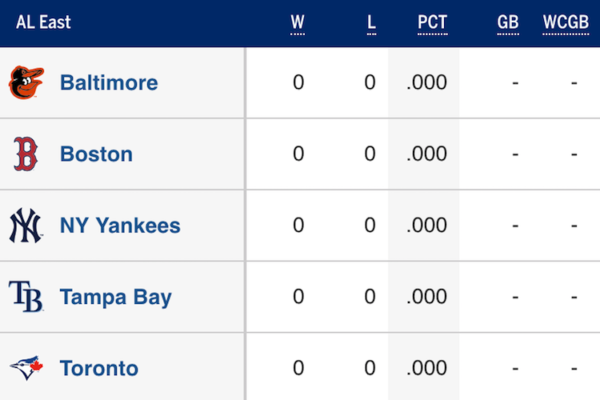 But like I said in the write-up about the Yankees, the AL is about four teams and then everyone else, and the Red Sox get to play the same schedule as the Yankees and will once again flirt with a high win total. I just don’t think they’ll get there. I feel the least confident about this pick out of all the unders I selected, only because the White Sox are headed in the right direction and nearly there, while the other clubs have a ways to go. Signing Manny Machado would have helped greatly, as he stood them up, showing he could care less if his family members and friends in Yonder Alonso and Jon Jay are now on the team. The reason I’m picking the White Sox as they inch closer and closer to baseball relevancy is that for them to increase their win total by 12 from last season, a lot has to happen. A lot. When your best on-base guy is Jay, that’s a big problem. When your best on-base guy only gets on at a .330 clip, that’s a bigger problem. Maybe guys like Anderson and Engel and Moncada will break out and prove their viable everyday players in the majors. And maybe Carlos Rodon and Reynaldo Lopez will stay healthy and continue in the right direction and maybe Lucas Giolito will finally live up to his former No. 1 prospect status. That’s a lot that has to happen, and if it doesn’t happen before the trade deadline, Abreu will be gone as an impending free agent, and reaching 74 wins will become even harder. The Royals did nothing to improve in the offseason, they actually got worse, and yet, their number is 11 wins higher this season. Everything about them says “Last place in the AL Central” and that was with Salvador Perez and now Perez is out for the season, needing Tommy John surgery. Royals fans can’t be too upset though. They reached the World Series in back-to-back seasons, winning it in 2015 and after 30 years of being awful, this October will only have been four since they destroyed the Mets. I think Royals fans are OK with waiting at least another decade before they start to complain about the state of their team. The Blue Jays are now in complete rebuild mode after having missed out on their championship window. First, they let Jose Bautista leave as a free agent and then Edwin Encarnacion and then Josh Donaldson and then they released Troy Tulowitzki, essentially now paying him to play for the Yankees. The heart of their order from their 2015 and 2016 ALCS appearances is gone and any valuable assets they have left between now and the trade deadline this season will be gone too. The Blue Jays are gong to be bad in 2019. After the trade deadline, they are going to be very, very bad.